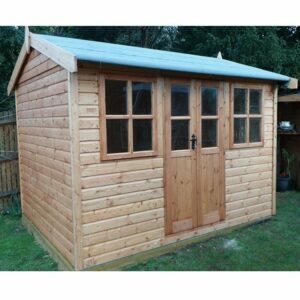 20% off all Malvern sheds, summerhouses & playhouses this month! A double glazed summerhouse featuring full height doors & windows in the gable end to maximise light and provide a more contemporary feel. Online pricing & customisation is not currently available for this product. Alternatively please email us your requirements and we will reply with a quote & further product information. 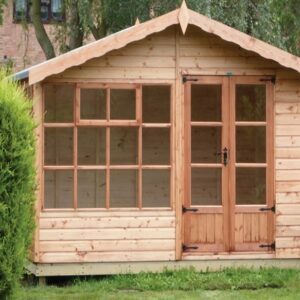 We supply a range of garden buildings from the UK’s leading manufacturers at very competitive prices. If you find the same product cheaper elsewhere though, we guarantee to beat it. We are an independent family business that has been trading for over 25 years. 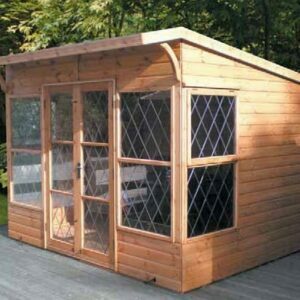 Berkshire Garden Buildings is a name you can trust for all your garden building requirements. Most products we sell come with free delivery & free installation. For those that don’t, such as greenhouses, we can normally recommend a local fitter. © Berkshire Garden Buildings 2018. The content on this website is owned by us and our licensors. Do not copy any content (including images) without our consent.